3. Contact all my competitors offering them a finder fee if they turn in customers they can’t service to me. Though it’s nice to be visible on Google Local, I don’t think it’s achievable in days if not months. Excellent points, Ashwin. I agree. 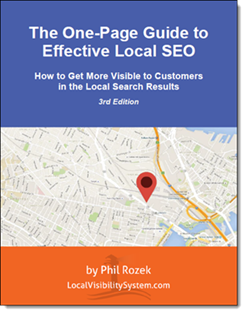 Being visible in Google+ Local isn’t usually achievable quickly at all, but – as I mentioned to Pat – it really depends on the circumstances, on the industry, and on the competitive landscape. Yup! If it’s an industry which is easy to rank for, G+ may yet make sense. I think there’s a goldmine of opportunity awaiting anyone who can hack into weather APIs to automatically run cross-channel campaigns for local businesses like Pat’s that are weather dependant. My recommendation in this situation would be a combination of Ashwin’s and your (Phil’s) advice: I’d definitely set up a Boulder specific landing page but then put my time/$$ into AdWords/PPC for that area/page. AdWords is quick and nimble and customizable – this (in my opinion) is the perfect use for it. I agree, Eric. Thanks. My client could tell that I wasn’t saying “Hell yeah – go for Google Places!” precisely because it usually takes too long, and because it’s not “nimble” (to borrow your word). Excellent approaches from both of you. Good sound advice that really anyone could benefit from. Phil – any update on this? did your client get that Boulder location? if so, what kind of SEO work did you end up doing for it? Nah, he decided against it. Didn’t do any SEO for it.